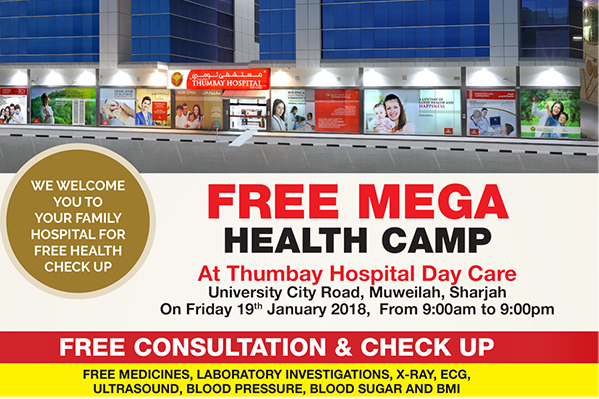 Thumbay Hospital Day Care – University City Road, Muweilah – Sharjah, the multi specialty day care center operated by Thumbay Group’s healthcare division, will be conducting a free Mega Health Camp from 9 am to 9 pm on Friday, 19th January 2018. The camp aims to increase awareness and promote medical and dental health among the public. Free consultation would be available with specialist doctors. In addition, the camp would also offer free medicines, laboratory investigations, X-ray, ECG and Ultrasound, as well as blood sugar, blood pressure and BMI checks. Thumbay Hospital Day Care is a multispecialty center which offers treatments and procedures as day-cases, meaning no overnight stay in the hospital is required, and patients can rest and recuperate in their own homes. Fully-equipped laboratory, radiology services with ultrasound and x-ray facility and trained personnel to ensure optimum patient safety and satisfaction are some of the highlights of the hospital. All major specialties are available at the hospital, complete with ambulance services and dedicated insurance and administrative back-up. For more details on the camp, please call 06-5449444 or 050-2196591.